In no particular order, here’s some stuff I saw at SIGGRAPH 2010. Only had actually 10-12 feather templates but the proceduralism allows them to be highly varied. the UV space and mapped back onto the feathers. They generated curves from their fur system and then built the feathers there. You could preview a dozen or so in Maya. For non-hero feathers, you defined the feathers at modeling stage. intersect. Under all the feathers, they put a lower level of fur to cover the skin. •Animators had proxy feathers in their rig. •They also deformed the invisible nurbs planes, then mapped the spines of the feathers onto those planes, picking up the orientation & twist from the NURBs plane as well. This guaranteed you don't get any intersections but still avoided getting any stretching. For hero shots, you could pre-generate the curves and then put extra deformations on top on that (dynamics & turbulence etc.). All the caches and etc. got rebuilt automatically when a new upstream asset is checked in. •In the RMan procedural, they generate the curves and figure out which template they're going to use. That lets you take the bounding box and bound the memory use pretty accurately. •Had a whole LOD system that could automatically turn down barb count and increase width. That worked great for static LOD. •They also built a system where they just randomly removed barbs and increase width that they used when they needed dynamic LOD (it didn't look as good) but most shots were able to use static LOD. •They also used the generated feathers (the same ones they use for Maya preview) as the geometry to calculate ambient occlusion. That way they never had to ray-trace against the full curves for each barb. They don't use Maya curves, they have their own curve node in Maya which represents all curves in the scene as one Maya node. Driven by Tree Initiative: an exercise prior to production where a cross-disciplinary team from design, technical direction, and modeling worked on a possible pathway for developing trees. Fundamentally you want to compute the visibility curve showing the fraction of light which the is passing through the material at a given depth. Uncharted 2 was one of the biggest games of the year last year, famous for its integration of character and story into widely varied gameplay. John was the Character Shading Lead for Uncharted 2. In Uncharted 2, we needed something faster (our game is in ShaderX7). You can think of the real nVidia technique as a 100-tap filter created during those 5 blur steps. One simplification was to approximate the 100-tap filter with a 12-tap filter; that’s faster, but it wasn’t fast enough for all of our situations. •Pretend the R, G, and B normals are different from the normal map. •A lot of people say cloth doesn’t have specular. • An Inner lobe that points at ??? •It’s supposed to look terrible in Maya! Kelman-Zure-Kalsz is a good model for specular modulation if you can afford it. 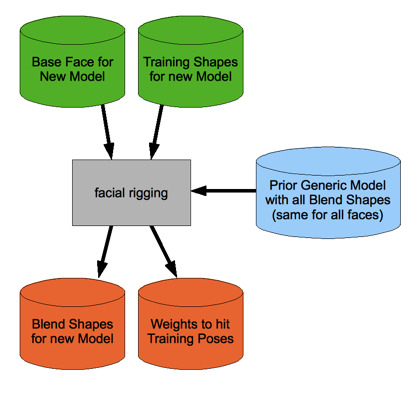 The paper is online at http://people.agg.ethz.ch/~hli/Hao_Li/Hao_Li_-_publications_[Example-Based_Facial_Rigging].html. I didn’t bother writing up the talk; it is yet another system for generating bad animation quickly. •How to comp volumetric, soft elements? •But this is slow & painful – especially with 50,000 rendered elements! Wrote GPU-based visualizers for level sets, vector fields, scalar fields, etc. Variety of snow types, low of snow interactions including fur, hair, etc. This was the coolest thing at the show (and it has nothing to do with computer graphics). 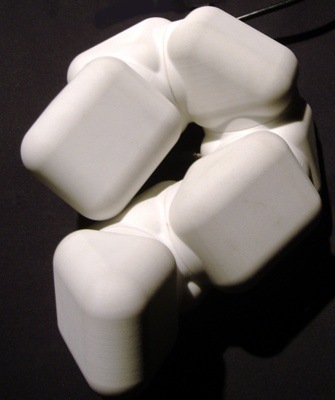 The ADB is a robotic creature built out of about 10 organically-shaped segments printed on a 3D printer. Each segment has a microprocessor, contact sensors on the sides, a little bit of battery power and two rings that connect it to the adjacent segments. The rings have a servomotor in them so each segment can turn relative to the adjacent ones, and the rings aren’t parallel, so the creature can curl up. The programming of the creature is that when you touch up, it curls up towards the place where it’s being touched -- in other words, it’s attracted to touch. You can easily overpower the servos, so you can always reconfigure it if it gets too snarled up. Additionally, it sometimes does spontaneous movements as well, which all creates a real sensation that it’s alive when you’re holding it. A lot of people I describe this to think it sound kind of creepy, but actually it’s a great experience. Unfortunately, it doesn’t translate well to pictures or verbal description -- it’s really something you have to hold in your arms to understand (in that sense, it’s a perfect interactive experience -- you can’t understand it from the web). ADB seems like it should be from Japan, but in fact it was made by two artists from Toronto. They were really nice, after experiencing ADB I stayed and talked to them for quite awhile. Another thing I noticed funnily enough about this exhibit was the concentration of current and former Pixarians at it; just before me Rick Sayre was there and my friends Bena and Tristan came up right after me. I’ve actually met some of the folks from Monkey Lectric before, I almost ordered one last year and still plan on getting one eventually. Basically, they figured out that if you mount a strip with a bunch of LEDs along a bicycle spoke and ride the bike, you have a potential display in radial coordinates. If you put three such strips around the bike wheel and ride at a reasonably speed, persistence of vision will give you a full disk of display surface (two seconds looking at the web site will get the point across faster than my prose). It’s a great idea, and to make the point of how general-purpose it is, this year they had a bunch of paper which circles printed on it -- you grabbed magic markers, colored your scene on the paper, handed it back to them, and a few seconds later your image was on the rotating bicycle wheel looking out over the room. 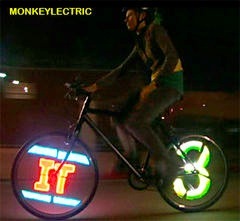 Totally fun and best of all you can order one right now for your bike! This was my favorite eTech installation this year. It’s basically a low 3’ high cylinder that projects a laser line on the floor. It also has a pretty accurate sensor though, so it knows if you’re stepping on the line or not. The line rotates around the cylinder and by stepping on it or not you affect the music that’s being generated by a network of a few of these. It was really fun to interact with, I spent about five minutes dancing around the thing. Unfortunately, I couldn’t really see where the networked aspect added anything -- if you want to make something emergent happen with a network of these I think you’d need to have them within eyesight of each other. Winner of the funniest piece at the show, these very postmodern ironic takes on just how interactive we want our garments to be definitely made me laugh. Unlike ADB, you can get the gist of these items from the above website quite nicely! Sony has built a fully realized prototype of a 3D display. It’s a small cylinder about 6” across and 8” high inside which spinning LEDs create a full-3D luminous volume display that requires no glasses or other attachments, is visible from 360 degrees, and has pretty good brightness. They didn’t mention prices or anything at this point, but it’s a neat and very well-packaged device even if the resolution was a little low. They had a number of information display demo loops, but the funnest thing was an implementation of Breakout that ran on the surface of the cylinder (all the way around). Because it was really 360-degrees, to play the game you had to keep physically walking around the device, which of course I though was awesome! This was a neat idea: they use a monostable light-reactive material to create a high-resolution display. The material actually changes in response to light so that it is perfectly visible either in the dark or in bight sunlight; furthermore, because the effect persists for a small number of seconds, a display can be sustained with a very lower amount of power (a high-resolution display might only require 2w). However, because the persistence is so long, it can’t display animation or other fast-changing images. The question they pose is basically what applications this is good for -- but it’s a viable and cheap technology. One of the few scent-powered installations, by placing a perfume-ridden piece of paper onto a network of wall-mounted projecting “flowers” you determined their growth patterns. This was a simulated torso that reacted (slightly) to your touch, and also where your palmprint left behind an afterimage. The idea of this augmented-reality research project was to combine a laser projector and a time-of-flight sensor into a single unit. Thus, it can both project information onto a surface (such as a hand or an array of objects on a table) and sense color and depth information from them. The idea seems really neat but none of the live demos were that compelling. This was a little thing you clipped onto the end of your finger. It contained a spatial sensor and electrodes that stimulated your fingertips to provide a tactile display based on the luminence or other properties of the rear-projected image you were moving your fingers across. It seemed to be very hard to calibrate -- they had to turn it up all the way in order to get it to work with my fingers. Frankly, while the idea is fine, it’s not something I’d be willing to actually do; the sensation was not pleasant and the spatial resolution of the information was too low to be a meaningful source of input. It was a valid effort to try and build a tactile display, though. OK, I teach at Keio but I’m still dumbfounded by this. They built a grid which can inflates soap bubbles at each point on the grid. The claim is that the existence and size of the soap bubbles constitute some sort of display. Except that um, soap bubbles are kind of hard to see... and they pop... But it was definitely a hunk of messy equipment! This was a small cylinder you held in your hand, and it produced vibratory sensations (aka a “tactile display”) on the bottom based on the pattern of light and shadow projected on the top (they set up the installation with patterns that were like leaf dapples). It did just that, not much more depth to it though. This installation was impressive to look at (100 stand-mounted, computer-controlled flashlights) but neither I nor anyone I talked to ever was able to understand what it did or how it did or didn’t relate to the viewer. There’s a description in the catalog, but it doesn’t correspond to anything I was able to observe in the gallery. This was a wheelchair-controlled POV tour through a Second Life environment of imagery that seemed like it was intended to be disturbing (i.e., babies you can’t easily avoid running over). It seemed to be designed to produce some kind of emotion I didn’t experience. Collada is a file format for 3D graphic data interchange which has been around for quite a few years. The last pipeline I built at Electronic Arts used Collada as its input format, which is a fairly typical use of Collada (Collada is also well-known as the format inside SketchUp 3D, Google’s easy-to-use 3D application used to create the 3D models for Google Earth). Although we don’t have a lot of use for Collada at Polygon (see the entry on Alembic for something coming up that may be more applicable to 3D animation), I always check in on the Collada BOF to see what’s new in that world. None of that would mean anything if there weren’t likely to be implementations. However, Mozilla started the WebGL project and has a Firefox implementation, and Google Chrome, Apple WebKit, and Nokia on some of their smartphones have all implemented WebGL (as usual with new web technologies, Microsoft is the holdout). The other interesting thing I saw at the BOF was a couple of guys Rightware (http://www.rightware.com/) in Finland demonstrated a really neat development environment they created around this. Basically it is a development tool for creating slick user interfaces for mobile devices using 3D. More and more, GUIs for mobile devices are becoming highly interactive and using sophisticated graphics. In fact, developing the interfaces for some devices makes lots of sense, and their tool allows you to interactively develop the UI in the tool (taking Collada media as input), and then eventually kicks out the code to implement your UI as compiled code for ARM (the processor inside most phones, iPhone and Android included) that expects only to have a OpenGL ES implementation on the target device. Rightware is a spinout (of Futuremark) and venture-backed, so they have a lot of pressure to produce. The market may be too small for a venture-backed company to succeed in, but it seems like they fulfill a real need for UI development for mobile devices. I thought this year’s Electronic Theater was a big step up from the terrible show last year, and in fact I thought it was just fine. However, I’ve rarely heard as divergent opinions: a number of people agreed with me it was fine, but another group of friends strongly felt it was too long and boring. I don’t really have an explanation for that (of course, it goes without saying it wasn’t quite as good as the Electronic Theater we managed to put on last year at SIGGRAPH Asia 2009, sorry Isaac ;-). Here are a few pieces I particularly liked from the ET. No arguments with the Best of Show award this year. Ilija and a couple of collaborators from Filmakademie made an unbelievable piece about moth and spiderwebs with their typical flair. Nuit Blanche is a amazing Canadian film noir done in incredible slo-mo of a man locking eyes with a woman through a restaurant window and the resulting events. Black and white, beautiful and beautifully realized. Hysterical Argentinian commercial about a man and his faithful dog fish. The one part of last year’s Computer Animation Festival that was awesome were the live real-time demos conducted before the show -- that’s where I got to see Flower, still one of the most amazing achievements ever in videogames. Frankly, there was nothing that earthshaking this year but the session was still really good. The standout for me was the NVidia Real-time Particle-based Liquid Simulation on the GPU demo with a couple million particles driving a fluid simulation in real-time. The demo was also available all week to play with upstairs; unfortunately, it was the one stand upstairs that was busy all the time. •Joseph Kosinski, the Director, has never directed a feature film before; he’s a commercial and game cinematic director. •Kosinski was insistent that the world of Tron be a mainframe not connected to the internet; he wanted to stay in the original world, not have “the Facebook army” and “attack of the Twitters” (that was one of the funniest remarks of the panel). •For the original TRON way back when, the way they created the glow effect for the suits was to shoot all the live action in black-and-white with the part where they wanted to glow painted white. When they developed that film, they had clear film where the white was and black elsewhere; they then shot the film under an animation camera and backlit the film, producing the glow. •For this TRON, Kosinski wanted to often use the glowing suits as the main light source in the scene, so they actually fabricated latex suits with electroluminescent panels for all the actors. The suits each had a battery back in the small of the pack powering the EL panels; the batteries didn’t last very long so the call on-set was “Lights, Cameras, Suits, Action!” All the other lights on the set were dimmed down so that the EL suits were the brightest light. •Kosinski does like CG, but even so wanted to do as much of the work practically as possible. Almost all the major sets were built physically, although CG set extensions were of course needed. •In the new movie, the riders on lightcycles are actually on the outside of the vehicle. This was the original design from Moebius for the first movie, but it was impossible to realize in MAGI Synthavision software, so they changed to the enclosed design seen in the first movie. •The new movie has 18 months of post-production. •As was reported, Pixar’s brain trust was called in to watch a rough cut of the movie and gives notes before the pickup shoot scheduled in June. Everyone said it was great to get feedback from other filmmakers... not sure if I believed them or not. •The movie was shot with two Sony cameras on side-by-side mounts. However, the mount and the cameras are just big and heavy enough that the Digital Domain VFX Supervisor talked about all the problems they had keeping the stereo convergence working. If he did the rest of the movie as well as the 7 minutes we see, I’d say he licked the problem pretty well. Sohonet is a networking infrastructure and connectivity company that provides high-bandwidth remote video access and preview services for clients. In particular, they sponsored the SIGGRAPH Computer Animation Festival this year by supporting all submission to be uploaded directly to Sohonet’s servers, and the jurying to be done by real-time viewing off of those servers, all at HD resolution. They are definitely one of the leading companies providing this service; unfortunately, I don’t know much about their price structure. Aspera, which occupies a slightly different part of the storage solution, was there as well. Basically, Aspera has an FTP server and client which implement a non-TCP-based version of file transfer which they claim will get 3x of more bandwidth from the same underlying network connectivity. So while, Sohonet is trying to let you preview everything over the net in real-time, Aspera just tried to optimize your non-real-time FTP-style transfers. I’ve used Aspera before and it works well enough, but it doesn’t impact your workflow much because really it’s just another implementation of secure FTP. However, at the show I learned they have an API so it might be possible to implement much higher levels of workflow integration. Several companies were showing very low-cost, low-overhead desktop 3D scanners. For instance, pico scan ltd. showed their namesake product, which attaches a small projector to a Canon EOS 1000D to produce a desktop scanner that can hit 0.1mm accuracy for E1999 (www.picoscan.eu). There were 3 or 4 solutions like this on the floor that can capture shape and color simultaneously. At Polygon, it doesn’t come up that often that we need to make a model of something that physically exists, but for those companies that do (e.g., for commercials) it seems like these desktop scanners could really speed things up. For the first time I can remember, all of the major storage vendors were at SIGGRAPH. Isilong had a booth, as did EMC. Blue Arc (one of the storage vendors that focuses quite a bit on our industry) was there and in particular, one of their success stories was Ilion Animation Studios in Spain, one of Ruth’s former employers and a company with much lower budgets than the Pixars or DreamWorks’ of the world. Ilion made the feature film Planet 51 (which I hadn’t known), which is the project that forced them to bring in a BlueArc solution. They had 200 artists, 300 physical render nodes and ran Nuke, Maya, and Max as part of the production. It provided fully os-independent NFS and CIFS service. Interestingly, they only got up to 90TB of storage total. I chatted with the Isilon representative as well. Of the two people at the booth, one said they had a great show and one said they had a terrible show (?). I didn’t know that Isilon has a lower-end storage line (the NL series) in addition to their mid-range line that we use (the IQ X-series). This company spun out of cutting-edge research a few years ago continues to make stunning cities via their hybrid of GIS import, piece assembly, and procedural city modeling. It’s important to keep them in mind: if the city sequence in your piece is important enough, this would be a great tool. Like Massive, it probably would take some time to master.